My name is Brian Sloss and I hope you will join me for a days guided fly fishing on the most beautiful river in the Missouri ozarks, the Eleven Point River. I guide the river strickly in conjunction with the Eleven Point Canoe Rental, a licensed outfitter with the USDA Forest Service. I have been guiding clients in my drift boat since 2004 and no one has logged more guiding hours on the Eleven Point river with fly fishermen than me. I enjoy taking anyone from first time fly fishers to seasoned vets. You will love the scenery and the fishing. The Eleven Point River runs mostly through US Forest Service land and is, therefore, largely undeveloped. You will not see cabins and resorts along the banks; just forest, bluffs, springs, wildlife and hopefully, plenty of fish. The Eleven Point river boasts some of the prettiest rainbow trout in the ozarks, with average fish between 12-15 inches. There are plenty of 20+inch 'bows as well, though you don't catch these Eleven Point monsters every day. 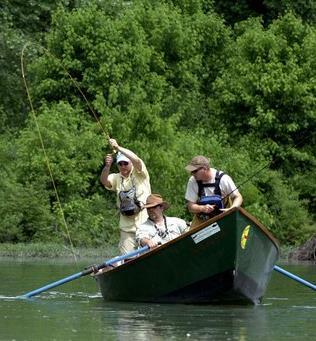 The river has 20 miles of trout water, including a 5.5 mile "trophy" or blue ribbon section. The entire river has a 15 inch minimum length, 1 fish limit on smallmouth bass, making for excellent smallie fishing. I love doing half day trips in the winter for these guys. A full day in the drift boat for up to 2 anglers is $350. The day on the Eleven Point includes lunch, use of rods and reels, flies (though you are encouraged to bring some as well), instruction and good company. Gratuity not included. Half day is $250 and includes all the same, minus lunch. You are encouraged to bring waders (no felt), rain gear if needed, sun block and a desire for a good time fishing. Give me a call at 417-270-2497 to book your trip.